From the unbelievable mind of our in-house sculptor, this resting hare is available exclusively through Nemesis Now. Gracefully resting, this hare watches from afar, away from danger. His ears are pricked, something has peaked his interest but he remains still. 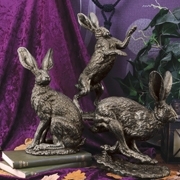 Cast in the finest resin before being painstakingly hand-painted and finished with bronze, this hare will make the perfect addition to any wildlife enthusiasts’ collection.